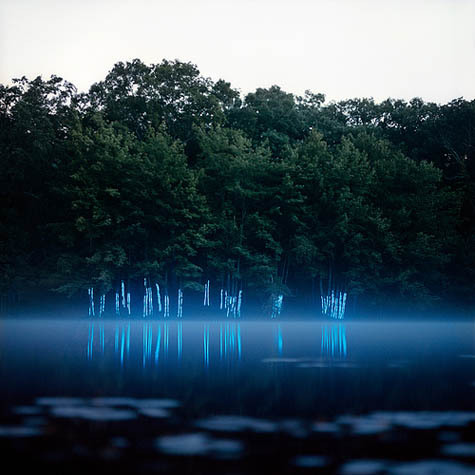 Peter Rose is a video artist who does incredible work with deep spatial and architectural implications. Here is his video, Transfaluminations, which pursues many of the ideas we are looking at this year. He would also like to remind you that there is no animation here, that this was done with just modified flashlights and video projectors. Click here or here for more of his work. I tried for the longest time to keep from posting this, since it’s a bit close to my investigation of the architecture of “the moment before…” But I really cannot get over how good the level of analysis is, so I have to share. The clarity and cohesion of the analysis of the experience used as the raw material for the art is powerful. The seizure maps (shown above) are really incredible. The extra step of not just making digital plots or digital image files of these, but putting them on canvas is an extra level of artistic resonance that makes them even more meaningful. It’s understandable that the aesthetic of the work is at a bit of a remove from the intensity of the experience, since this is the artist’s life, less easily objectified and stylized, but nothing assails the level of quality of the analysis. This is not art about epilepsy, but the art of epilepsy. By harnessing the unconscious harshness of the ictal, it has a power to evoke and transform that bridges any remove that may exist. Here are the thoughts running around my head these days. I am interested in how to go further into the dark cave – as exemplified by blind people who must do this every day of their lives. This was started by an interest in synaesthesia, and then in the accompanying idea of navigation by nonvisual methods. Such as by touch, eg by a blind person’s cane. How do you navigate with little or no visual sense data? 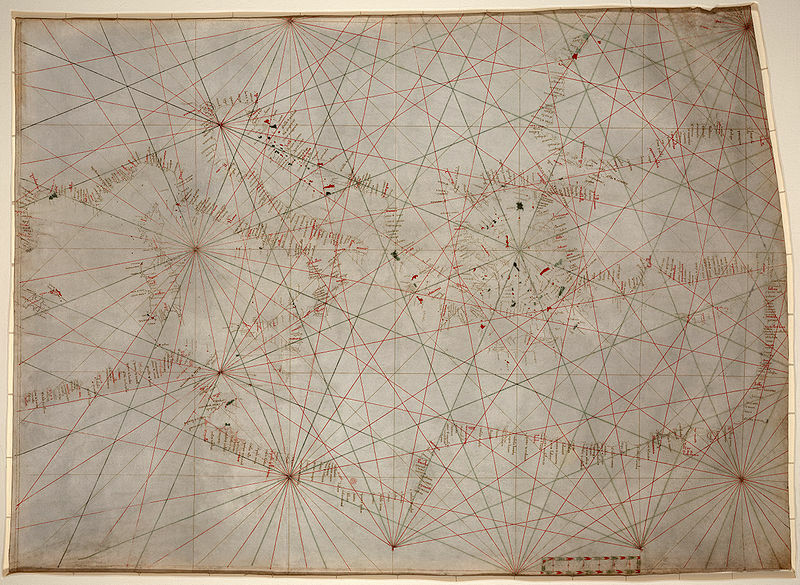 Or “Portolan Chart” is a way of representing the edges of land via text. They exhibit emergent properties, technologically, and formally. This time I live in, this time it runs and takes me with it. Here’s the video. But don’t go if you’re easily offended – this is a piece of magickly transformative experimental film. … trying to get to a machine that prints random poetry once it reaches a threshold of stress or novelty – something that would be triggered by an event in the making. Regarding syntax, The Schema of Ulysses. Of course, people get doctorates for examining this novel in just a literary sense – it’d literally be a life’s work to give it design correlation. But, this and this are excellent examples of the narrative and evocative power of cross-reference and correlation. These particular tables may be useful as a relational database to be represented by data outputs. Outputs from where you ask? The Geometries In, Of, and Between Air Street and Lavender Hill. 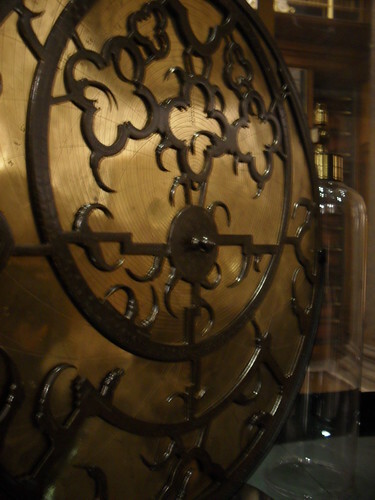 Still getting my head around this one too… Went to the British Museum yesterday to look for the geomantic device on the wikipedia article Shaun sent my way. Didn’t find it, but my search will continue. I did however find John Dee’s tablets. Spooky and beautiful. 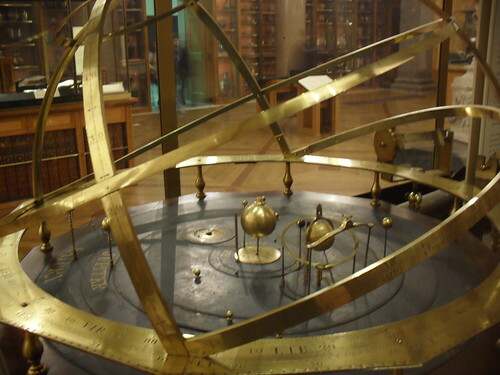 And I also found an orrery and some astrolabes, which are devices with very interesting properties and uses… Since this whole exercise is a bit about divination of the immediate future, and these have that use, they may come in handy. Of course, all of this stuff – when added to my currently expanding mind map is far too much for a year, let alone for this Thursday or for end of term, but I am confident that it will all collapse down into something really killer. How do we make our way ever deeper into the darkness, and find what is there to help our transcendence? Another “wetware” breakthrough, at University of Washington they are making appreciable strides toward contact lens encapsulated heads-up displays. Examples include subtitles when conversing with a foreign-language speaker, directions in unfamiliar territory and captioned photographs. The lens could also serve as a head-up display for pilots or gamers. It reminds me though… these things harvest power via induction from radio waves – or the researchers suggest, from the cell phone (read – minicomputer) that it gets its data from. Tesla had proven the value of inductive power transfer long before most of even the US had domestic power whatsoever. Imagine if his ideas had won, rather than Edison’s. What would our world look like? In other news, I am really enjoying the copy of Communicating Vessels that I was finally able to procure. I am about to start in on Bernard Cache’s Earth Moves, as well. I have had successful trips to Lavender Hill to collect data and materials on the last two days. And I think I will go there AND Air Street today to read before I head to school. But while studio is closed and I’m shut away from my supplies for the wild art I am attempting to create (more on that later), I am going to finish off the day out with the University’s fine collection of Rebecca Horn. Next, beautiful pictures of Mars. No computer can replicate the unspeakable beauty of millions of years of wind. Finally, the ever incredible website Polar Inertia. Just because it’s incredible. Check out the book here. It’s incredible, do everyone including yourself a favor and buy a copy! Speaking of ecologies though, both Polar Inertia and The Infrastructural City are great considerations of the ecologies of modern urbanity. From our colleagues over at the Bartlett MArch Urban Design, tomorrow’s thoughts today, comes the concept of the Productive Dystopia. They’ve found the limit of statist capitalism… New Ordos. This is incredible. Found it here. It’s the inverse of this. Which I found here – back in the day. In tutorial yesterday, we were talking about the camera obscura, and I was reminded of an artist I had seen years ago, but whose name I had not been able to recall. Found him. Abelardo Morrell. This is not particularly pertinent to my work, but the work is incredible, and I wanted to share – and give “press” to an awesome artist. Click through – this isn’t even the best picture.